To Brush Over It: What exactly is art therapy? I’d always known that art therapy was a thing, but I never thought to ask what it actually involves. Painting will solve your problems? It seems unlikely. For some, putting a feeling onto paper can be just as relieving as venting about your issues or finally getting a diagnosis for something that has been hindering your life. A writer on the blog The Tutu Project wrote that she likes art therapy as opposed to regular counselling because “it’s like there’s another presence in the room which helps you to express how you feel. You can do things with your hands rather than just talking.” It is commonly misconceived that you must be a skilled artist or that it is an exercise for children, but from a simple Google search, it is clear to see that people of all ages have benefitted from visualising their thoughts. 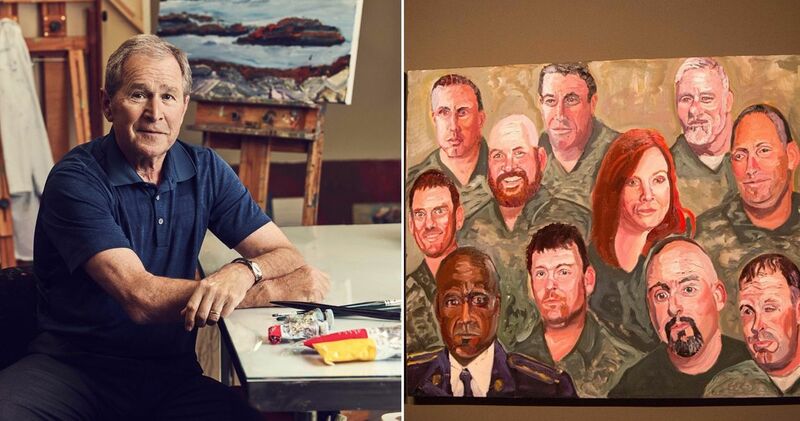 George Bush famously began painting as a hobby, going so far as to publish a book containing portraits of war veterans, Portraits of Courage. Many have speculated as to whether this was a conscious effort at art therapy, but based on what Bush says, it’s more likely that he was surprised at the healing benefits painting brought: “In a sense, it is therapeutic. Not that it unburdens my soul. It’s not the painting that unburdens my soul. It’s the belief in the cause and the people — to the extent that a soul needs to be unburdened. The painting was a joyful experience, and if that’s therapy, that’s therapy.” For Bush, painting is an expression of thoughts he wants to project. Aaron Gell, the journalist he says this to, speculates that the sheer pain in the paintings cannot only be a product of empathy but must be a reflection of Bush’s state of mind. Bush’s endeavour was nonetheless controversial; in Jonathan Jones’ review, George Bush’s paintings: this is the art of Forrest Gump, he says, “Idiocy in art has its charms. In the man who ran the free world into bloodstained buffers, those charms quickly sour.” It is a given that art cannot really heal all wounds, but Bush’s art is an example of the way art therapy can help individuals on a smaller scale than that of a former president. For example, art therapy extends beyond the reach of mental trauma into a form of emotional support for those dealing with physical issues. Cancer Research UK discloses that art therapy is especially beneficial to those dealing with cancer; artistic creation can help those dealing with chronic illnesses deal with their changing body image and take their mind off of the pain and discomfort they might be feeling. So, rather than simply being a form of therapy to see parts of yourself under the surface, art therapy can encourage positive feelings and confidence through both the process of creating and the relationship developed with your therapist. Art therapy can take both a light-hearted, Bob Ross “happy little accidents” approach to encourage positivity and confidence as well as a deeper expedition into some uncomfortable and hard to deal with feelings. Even though it won’t solve your problems, upon closer inspection, perhaps it is worth looking into if you are struggling yourself. ← Procrastination – why we need to snap out of it!